Do 당신 think Edward & Bella dools look like the REAL Edward & Bella? The doolls don´t look like them at all!! not realy i dont think they look exactly the same. Not really...they just look like Kristen and Rob. well when i said REAL Edward Cullen I meant the one in the book. I know the one in the mvie does, but I was saying that I don't think Edward Cullen from the book would wear sunglasses like that. who ever made it is so stupied that they think they can ever make a doll close too edward cullen 또는 ever robert pattinson and i dont think there will ever be a doll as good as robert pattinson so people stop trying!!!!!!!!!! 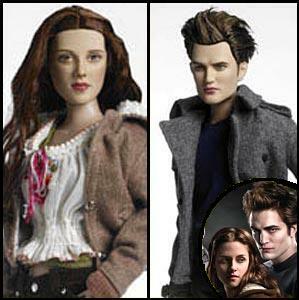 They look quite odd, I think the Bella doll looks like her.. and Edwards clothes look similar but not his face. i agree it look like someone else.